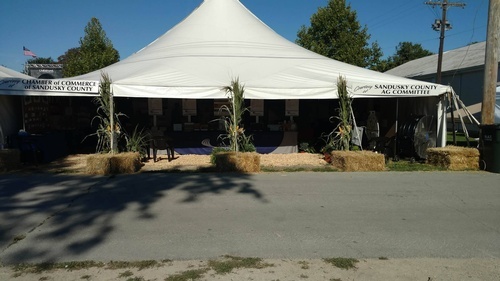 Every August, the Agriculture Committee of the Chamber of Commerce of Sandusky County coordinates the Chamber Ag Tent at the Sandusky County Fair. The tent project started a long time ago to promote the agricultural and business sector of Sandusky County. Each year we sell table spots in the tent to a variety of Chamber Members to promote their businesses. If you are interested in reserving table space or participating in the logo game, contact us for more information. Exhibitor spots are first-come, first-serve and sell out quickly. Contact pcoord@scchamber.org or 419.332.1591 to reserve your spot today! The cost to rent a table is $175, which includes an 8-foot table and two single-day worker passes. In addition, each exhibitor is required to sign up for two, three hour shifts as "Tent Greeter". Businesses also have the option to participate in "The Logo Game" for $50. The logo will be on The Logo Game board played by those attending the fair. Businesses have the opportunity to provide prizes for the winners. If you would like to do both, you receive a discounted rate of $200.